Showing an Avro Tutor flying above a training airfield circa 1942 - 43. Flown by AC1 Peter Divers and Wing Commander W.C. Radford. 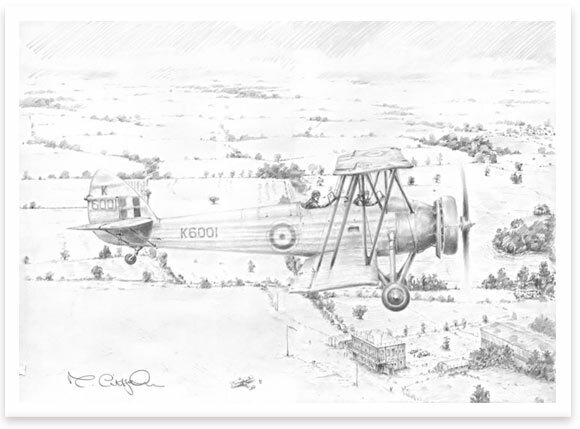 Each Print signed by Peter Divers who was at 17yrs four months trained on the Avro pictured including flying lessons from Wing Commanders Radford (KIA, over Hamburg) and Johnny Fielding he then volunteered for hazardous duties with Combined Operations in the Far East. Having conducted training they were to be parachuted onto Japanese airfields to destroy or occupy them for as long as possible in an attempt to stop or delay the inevitable Kamikaze attacks against the invasion, it goes without say it was considered by most involved to be a one way ticket! Peters father was Group Captain R.J. Divers, M.B.E. and had during the 1914-18 war served with the RFC in the Middle East, it was during this period he became one of the members of "Lawrence of Arabia's" Desert Flight and on many occasions flew the great man on his daring missions including being shot down on one such occasion and returning from the desert with his plane pulled by camels! After the war he became head of No1 Intelligence Wing RAF Indian Wing and was responsible for conducting the air campaign in the Pashwar against the rebellious tribesman of the Northern Frontiers. During the second war his father served as Sqn OC of an OTU in Cheshire and still fired up by thoughts of getting at the "Hun" took of in one of his Hurricanes to chase some German raiders attacking Warrington for which he took some flak from the High Command for having endangered as they put it the life of such a highly respected and qualified pilot. Peter himself has lived an eventful life including surviving the dramatic event of the wreck of the merchant ship Nelly Bywater during which he was lucky only to lose most of his personal possessions and not his life! He has recently sat down to write an autobiography concerning that of his own and his fathers life, and would be delighted if any one contacts him regarding having met him or his father. Each print comes complete with photographs and background biographies of the veterans.